Michael Gnat, Charlotte Hampden and Lucy McMichael in The Savannah Disputation. Photo by Lee Wexler. 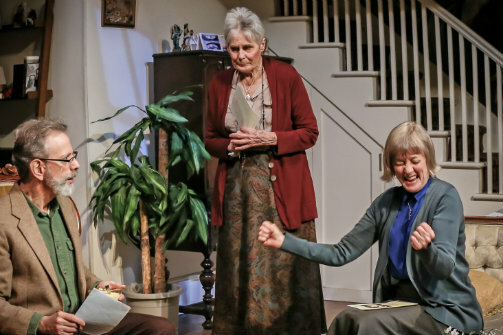 BOTTOM LINE: A solid revival of a play that presents a theological debate between Catholicism and Evangelicalism. The Savannah Disputation is essentially a theological debate in which the characters are hell-bent on proving that they belong to the one true religion. It’s Catholicism versus Evangelical Christianity and the debate is far from friendly. Melissa (Katie Yamulla), an Evangelical Christian, shows up at the home of two unmarried sisters, Mary and Margaret (Lucy McMichael and Charlotte Hampden, respectively), to ask the age old question: “Are you saved?” Outraged by Melissa’s attempt to convert her, Mary sends her packing. Shortly thereafter, she has second thoughts and invites her back in the presence of her parish priest, Father Murphy (Michael Gnat), to debate religion. What ensues is a theological quarrel between Melissa, who has an aggressive agenda, and a reluctant Father Murphy, who just wants to finish his bowl of banana pudding. “You have your faith and she has hers,” he explains to Mary, but her warlike tendencies will only be satisfied by the utter humiliation of her Evangelical guest. The Savannah Disputation, by Evan Smith, premiered at Playwright’s Horizons in 2009 and is now receiving a solid revival at the cell, a converted town house functioning as a theater. This play feels especially at home in this space as it takes place in a 1920s era living room, and this very space might have been someone’s actual living room in the 1920s. Audience members are instructed to use the bathroom in the kitchen, which is an actual kitchen but also part of the set. Set designer Sarah Edkins uses this elegant space to her advantage, adding a beautiful and appropriate, religiously-themed mural on the staircase. Katrin Hilbe directs a company of four capable actors, all of whom serve the play well. Though this is a revival, the script did not always feel fully finished to me. Twice in the play we hear a doctor's office leave a message on an answering machine informing Margaret of some test results that need to be discussed. But this detail is hardly ever addressed and it's never resolved. It feels like a forced attempt to infuse a spiritually-driven play with the issue of mortality. I understand the impulse, but the device never finds its function. Catholics and Evangelicals may find this debate intriguing and entertaining. But as an outsider to both faiths, I have no skin in the game, and so I found my interest waned. I’d like to be able to say that this play offers a universal exploration of conflicting religions. But it’s a thorough exploration of Catholicism versus Evangelicalism and if you have no investment in either faith, this may not be your cup of tea. The exercise of debate is a battle that employs logic and reason, and faith depends on neither. The Savannah Disputation is written by Evan Smith, directed by Katrin Hilbe and produced by Many Tracks and Me & She Productions. The production team features Sarah Edkins (set designer), Chris Steckel (lighting designer) Andy Even Cohen (sound designer), Page Clements (dialect coach) and Marcina Zaccaria and Dana Robbins (stage managers). The cast includes Michael Gnat, Charlotte Hampden, Lucy McMichael, and Katie Yamulla.